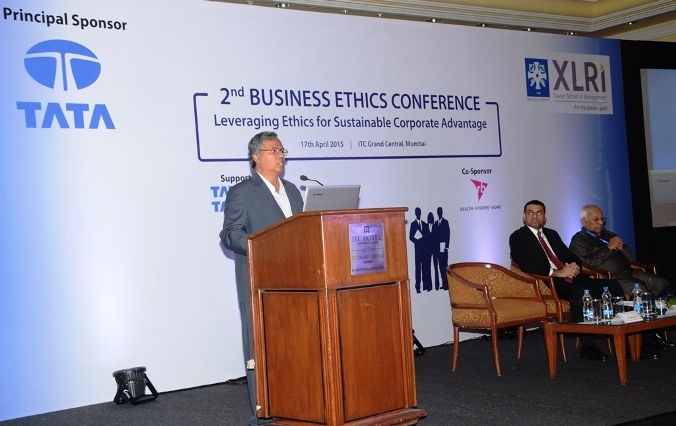 XLRI Alumni (Mumbai Chapter) organized the â€˜2nd Business Ethics Conferenceâ€™ in Mumbai. Ethics a much felt need by Corporate India and the Country at Large, to replace the existing ways of doing business and adopting sustained Ethical ways. With the aim to discuss some of the most pertinent questions related to Ethics and its significance in today’s business scenario , XLRI - Xavier School of Management, one of India’s premier B-Schools, in collaboration with XLRI Alumni (Mumbai Chapter) today organized the ‘2nd Business Ethics Conference’ in Mumbai. The event was inaugurated by Fr. E Abraham, S. J. (Director of XLRI), Fr. Ozzie Mascarenhas, S.J. (JRD Tata Chair Professor of Business Ethics at XLRI and founder of XLRI Ethics Research Center - XLERC), and key note address was delivered by Mr. Mukund Rajan (Brand Custodian, Member, and Group Spokesperson - Group Executive Council, Chief Ethics Officer, Tata Sons) in presence of other dignitaries. Fr. Ozzie Mascarenhas, S.J. JRD Tata Chair Professor of Business Ethics at XLRI and founder of XLRI Ethics Research Center (XLERC) and the host of the event said, “Ethics deals with human behavior and is currently reckoned as a responsible action program for the betterment of individuals, groups, organizations and societies. Ethics empowers us to chart and live a new value-laden direction in life. It becomes relevant wherever people interact and function together. Hence, every field of business such as planning and strategy, accounting, finance, human resources management, business law, marketing, business research, and production management involves ethical issues and challenges”. “Most corporate failures today reflect low levels of wisdom and phronesis, low level of ethical maturity, and often, a badly trained conscience. In the past two decades, corporate fraudulent business practices have precipitated cash crises and subsequent bankruptcies - consider Enron, WorldCom, Global Crossing, Qwest Communications, and Tyco; Satyam, 2G, 3G, CWG and Sahara. Organization that stays ethical in all its products and services will have corporate advantage that translates to higher revenues, market share, profitability, and market capitalization,” he remarked. Among the panelists at the conference were – Mr. Amit Chopra(Managing Director, Thermo Fisher Scientific, India), Mr. Arvind Vasudeva (CEO Formulations, Aurobindo Pharma), Mr. K Ramkumar (Executive Director on the Board of ICICI Bank & President of ICICI Foundation) , Mr. K S Kumar (VP, Human Resources, Castrol India Ltd), Ms. Meera H Sanyal (Chairperson, Urban development Committee at Indian Merchants’ Chamber), Mr. Michael P Pinto (Former Secretary, Shipping Ministry, GoI), Mr. Milind Sarwate (Founder and CEO, Increate Value Advisors LLP), Mr. Parshuram Date (Chief Risk Officer, Chief Internal Auditor and Chief Ethics Counselor, Tata Power), Mr. R Ramakrishnan (Vice Chairman, Joint MD and Group CEO, Polycab Group), Mr. Raman Madhok (Managing Director, CMI FPE Ltd & CMI Group Head – South Asia), Mr. Royston Braganza (CEO, Grameen Capital India) , Mr. Saumen Chakraborty (President, CFO and Global Head of IT & BPE at Dr. Reddy’s Laboratories), Mr. Srinivas Kantheti (Member, Group Management Center, Wadhawan Global Capital,) Mr. Suresh Gupta (Executive Chairman of Huhtamaki-PPL Ltd.) and Ms. Swati Rustagi (ex- Executive Vice President & Head Global Human Resources, Glenmark Pharmaceuticals). The conference has been sponsored by Tata Group supported by Tata Steel and Tata Power with Reckitt Benckiser as the Co-Sponsor.